If you could ask Jesus’ original disciples to describe discipleship, they would talk about someone who was totally committed to a particular rabbi. Usually, disciples literally lived with their rabbi and followed him everywhere he went. Communal living was absolutely necessary for living as a true disciple. Teaching happened more by example than by words as you lived with the person each day. The purpose of this commitment was to become “like the teacher” (Luke 6:40). 1. Committed to Christ. David Watson says, “A disciple is a follower of Jesus. He has committed himself to Christ, to walking Christ’s way, to living Christ’s life and to sharing Christ’s love and truth with others” (excerpted from “The Basics of Discipleship” on his website). You could probably add other items to this list. But be careful to not make this commitment legalistic. This should not become a list of do’s and don’ts that group members must follow. (I’ll address this in a future post.) You are simply defining what this group is all about—discipleship—and you are clarifying the commitment involved. 2. Committed to the group. When you start a new group, or when a new person joins your small group, make the commitment to discipleship as clear as possible. This is where your goals and plans come in. It’s important that groups help new people transition into the commitments the group has made to one another. This is a huge paradigm change for most people in the West. At the same time, the group is unapologetic for their focus on growing in their relationships with Christ. When a new person joins an existing group, for example, I train our leaders to take time to share stories (history) and help the new person to enter into this environment of mutual discipleship (see #3, below). Of course, setting the bar high like this has a trade-off. Some people will not join a group that requires high commitment. But for those who accept the challenge, you will make disciples. I imagine it was tough for Jesus to watch the rich young man walk away, but Jesus was committed to making disciples, not attracting crowds of consumers. 3. Committed to mutual discipleship. Mutual discipleship means we are committed to helping one another grow in our faith. This is what Paul meant when he said that Christ’s body should grow and build itself up in love as each part does its work” (Ephesians 4:16). In the healthiest groups, members are not only committed to their own spiritual growth, but to helping others grow. I’ll spend more time in future posts talking in practical terms about what mutual discipleship means. It’s vital not only to be committed, but to make those commitments to the right things. These are just the first three. Others, like missional living are also included. More on those in future posts. 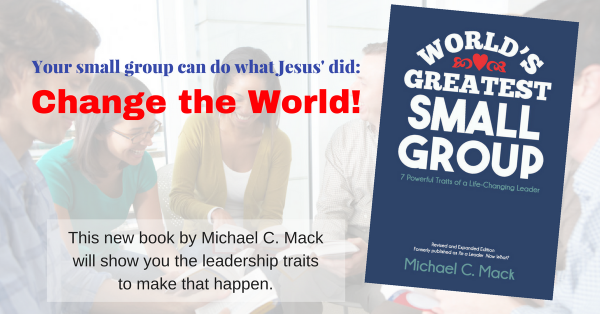 Parts of this post are adapted from my book, Small Group Vital Signs: Seven Indicators of Health that make Groups Flourish.